Any visit to the Museum of Modern Art will produce many great memories, as you traverse various exhibits in the city that never sleeps. But one offering stood out this winter — “Charles White: A Retrospective.” This exhibit pays tribute to famous Chicago artist Charles White, whose art focused on African American subjects. Though the exhibit featured many great pieces alluding to slavery and Jim Crow, a crown jewel existed among the gems. 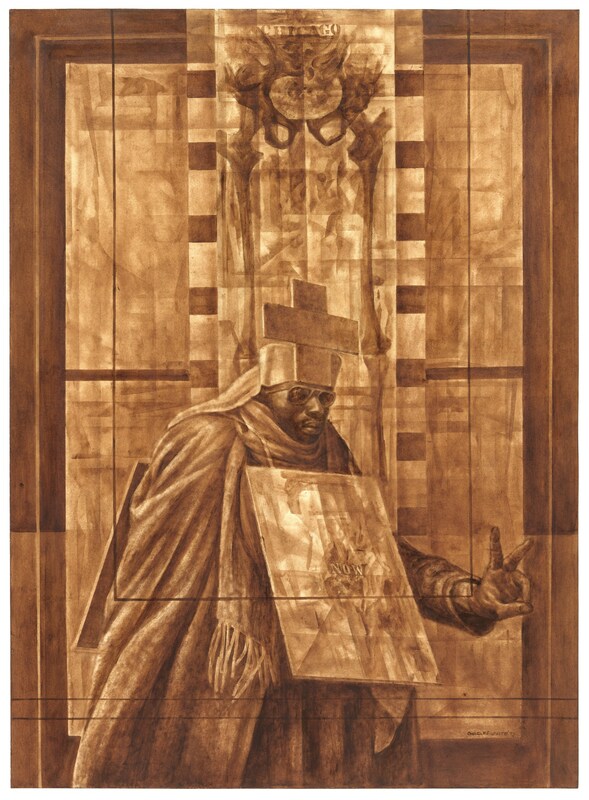 Painted in 1973, White’s contemporary artwork, “Black Pope (Sandwich Board Man),” depicts an African American Pope extending two fingers out as a sign of peace. In the center of the frame, the Pope is wearing a cross hat and a sandwich board which reads “NOW” in the center. Above the Pope reads “CHICAGO.” Underneath the word, a banner of a skeleton’s lower half hangs behind the Pope. The painting is oil-wash and colored in entirely sepia tone. The religious symbolism speaks to how many Black people used Christianity to remain hopeful for political enfranchisement since the days of slavery. The dichotomy in presenting a Black man as one of the highest symbols of religious, and by extension moral, authority, reveals the importance of African Americans advocating for themselves to end their oppression. The image subtly invokes the memory of Dr. Martin Luther King Jr., who embodies the intersection between nonviolent activism and religion and was killed five years before the work’s creation. The painting also alludes to Chicago, White’s hometown and a city infamous for race riots in the 20th century; given the setting, one can infer that the eponymous Pope is advocating an end to racial violence. These themes are only made more evident as White juxtaposes the Pope with a skeleton in the background, reminding the audience the consequences of failing to find peace and reinforcing the urgency. The translucent coloring makes the painting appear ancient, which gives its messages a sense of timelessness. “Black Pope (Sandwich Board Man)” serves as a successful exemplar of why art should be used for social critique. It provides striking political subtext to convey a foreboding message. The religious imagery brilliantly gives the piece grandeur. The painting’s sense of urgency, as seen with the sandwich board and the skeleton, conveys White’s passion for social justice. His ideas echo the sentiments found in Black Lives Matter, anti-war protests, and other types of movements. Instead of being “abstract” or “experimental,” the painting is accessible to the wider audiences and remains relevant outside of its historical context.